Don't let the term "low-impact" fool you. Low-impact aerobic exercise gives you a calorie-burning workout -- the perfect complement to your weight-loss plan. Low-impact exercises are less stressful on your joints compared to high-impact activities such as running and jumping rope. Low-impact aerobic activities are recommended if you're brand new to exercise, but also if you're overweight, pregnant or have an injury or chronic condition such as osteoporosis that makes high-impact activity risky. Walking is one of the most popular low-impact exercises you can choose, says the American Council on Exercise, or ACE. It doesn't cost a thing to start a walking program, although you might want to invest in a sturdy pair of walking shoes. On days when inclement weather precludes outdoor activity, take your walking program to the treadmill, a piece of gym equipment equipped with functions that allow you to control the speed and duration of your workout. The calories you burn depend on your weight and the energy you put into your step. A 160-pound person burns 276 calories an hour walking at a brisk pace of 3.5 miles per hour. Pick up the pace to 4 mph, and he burns 363 calories. Bicycling and stationary cycling are also easy on your joints. Recumbent exercise bikes are better for beginners, as they offer more back support. As with walking, intensity matters. Someone that weighs 160 pounds burns 290 calories cycling at a rate of 5 1/2 mph for an hour. Group cycle classes provide a motivational workout in a group environment; however, although you can burn a lot of calories during these classes, ACE cautions that some might be too vigorous for the average beginner. If you're just starting out, cycle at a pace that feels comfortable to you rather than trying to keep up with the rest of the class. 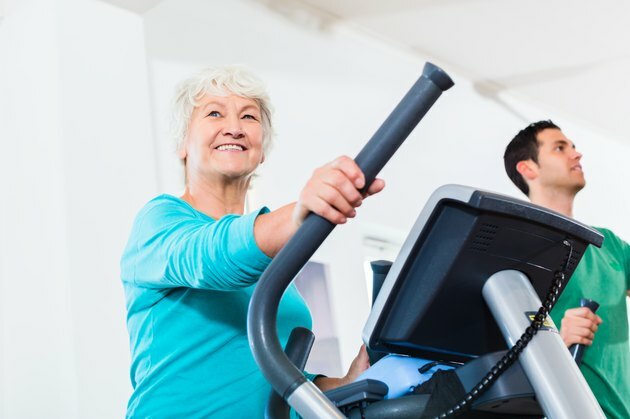 Exercising on an elliptical machine gives you a thorough workout and decreases the stress on your hips, knees and back, as both feet remain grounded at all times. Many elliptical machines are equipped with handles that resemble ski poles, which work your upper body as well. Exercising on an elliptical machine is a real calorie burner, too. A 160-pound individual burns around 371 calories exercising for 45 minutes at a moderately intense rate. Swimming slims and tones your whole body, because you use all of your muscle groups during this activity. The United Kingdom's National Health Service offers some tips, if you choose swimming as your activity of choice. Keep up a steady pace during the course of your workout. If you enjoy exercising in a group setting, consider trying out a water aerobics class. Swimming is a low-impact exercise that eats up the calories. Someone that weighs 160 pounds burns roughly 254 calories swimming for 30 minutes at a casual pace. Exercise is the way to go for weight loss -- in addition to a reduced calorie diet. ACE recommends burning 250 calories a day through physical activity and shaving another 250 from your diet to sustain slow, steady weight loss of one pound a week. Low-impact exercises, such as cycling and swimming, are exhaustive when performed vigorously, and they may not be appropriate for your current level of physical health. Keep it safe by easing into your new exercise plan until you build up your endurance. If you're a male over 40, a female over 50 or if you have a medical condition such as heart disease, please consult with your physician before you engage in vigorous exercise. ACE Fitness: What's the Best Piece of Cardio Equipment to Use? ACE Fitness: How to Lose Fat, Gain Muscle, Feel Happier and Get Healthier – At No Cost?